** Provide tutorials or content for the [[:Category:Popular Package|popular packages]] or [[:Category:Built-in Package|built-in packages]]. ** Add more content to [[Special:ShortPages|short pages]]. ** Document or add more [[:Category:Third Party Package|third party packages]]. ** Copy edit [[Special:RecentChanges|recent changes]] or be a moral police. ** Add more members to various [[Special:Categories|categories]]. ** Categorize one of these pages [[Special:UncategorizedPages|uncategorized pages]]. 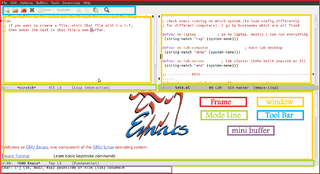 Emacs is available on all popular [[:Category:Install Or Upgrade| Operating Systems]] including [[Installing Emacs on GNU/Linux | GNU/Linux]], [[Installing Emacs on BSD |BSD]], [[Installing Emacs on OS X | OS X]] and [[Installing Emacs on Windows| Windows]]. It supports a variety of [[:Category:Programming languages|programming languages]]. * Click on individual categories and it will give you a list of all pages that will be of interest to you.